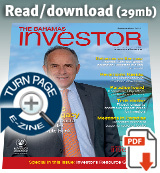 As a practitioner in The Bahamas’ financial services industry for more than 20 years, I have seen many changes. In my area of focus–trust and wealth management–we have always had regulatory oversight by The Central Bank of The Bahamas. Indeed, while some jurisdictions have not even thought about regulating trust companies, The Bahamas had trust company legislation since the 1960s. By the 90s, The Bahamas strengthened its focus on anti-money laundering and introduced legislation and guidelines. By the late 90s and in the wake of the Asian financial crisis, offshore centres became the subject of tremendous scrutiny resulting in the emergence in early 2000 of “blacklists.” However, nothing could prepare the sector for the pace of new regulation and spectrums through which we had to view clients in the aftermath of the terrorist bombings of September 11, 2001. High-tax jurisdictions increased pressure and continued to push the limits on financial confidentiality–a well-guarded principle in private wealth management. We have now settled into a new norm: “transparency,” and our industry is governed by new rules set out in agreements such as FATCA and the upcoming Common Reporting Standard. This is a new reality for centres such as The Bahamas–a reality in which we will have to adjust and continue to thrive. The Bahamas has always guarded its reputation as a premier financial services centre zealously as this sector has been the driver of our middle class and has led to advancements in the areas of information, communication, technology and education. It is a sector in which policymakers have ensured that The Bahamas adopts best practices in order for the jurisdiction’s citizens to maintain their way of life. The first direct call for change came in 2000 when a G7 finance ministers and central bank governors’ communiqué stated that: “In order to secure the benefits of the global financial system we must ensure that its credibility and integrity are not undermined by crime, poor regulatory standards and harmful tax competition. For the prevention of money laundering, we urge the Financial Action Task Force (FATF) to complete its identification of non-cooperative jurisdictions expeditiously and, in this context, we will coordinate our work with other ministries when appropriate. “We remain concerned about offshore financial centres and tax havens which undermine international standards of financial regulation and which are shelters to avoid or evade payment of tax. We urge the OECD’s CFA [Committee on Fiscal Affairs] to bring a rapid conclusion to its work on bank secrecy. The benefits and opportunities of the international financial system can also be undermined by corruption. In this regard, we support the work being done in various fora on anti-corruption measures. The Bahamas, using the Basel Core Principles for Effective Banking Supervision, continued to address and update its financial services regulation and readied itself for a review by the IMF of its regulatory standards. New laws which dealt with the proceeds of crime, international cooperation and the regulation of corporate service providers, for example, were put in place and other legislation was updated. Processes including on-site inspections of financial institutions and cooperation between the various domestic and international regulators were strengthened with anti-money laundering (AML) rules clarified and enhanced. As a result, new responsibilities were placed on employees and senior officers of financial institutions. The sector reacted by ensuring that staff were fully trained and the industry saw a surge of new training opportunities in the banking sector for anti-money laundering and risk management. The results of the 2003 IMF assessment of The Bahamas confirmed that the jurisdiction maintained sound supervisory practices. The post-2000 regulatory environment was a major change as regulatory actors became more intrusive in everyday activity and the sector adjusted to this new norm by making recommendations on ways to make the process more efficient and less costly to do business in terms of time and resources devoted to regulation. Industry associations also had to strengthen their advocacy roles to familiarize and train their constituents to the changes being introduced by the various regulatory agencies and the central government. Professional groupings such as The Bahamas Association of Compliance Officers (BACO) were formed to advance this newly prominent role in the industry. Clients adjusted too and for the most part were undeterred in their decision to utilize the services of international financial centres, which suggested that the importance of our centres, at their core, provided value to our clients that could withstand regulatory changes. By the end of the first decade of the new millennium, The Bahamas had committed to share financial information upon request with dozens of countries under specified terms. The era of the Tax Information Exchange Agreement was in full effect and within a few years the goal posts began to change to automatic exchange of information as governments sought to acquire information on the taxable assets of their citizens or residents located outside of their borders. Countries throughout the world were conscripted to assist. In September 2015, The Bahamas began this process with the sharing of information on an automatic basis with the US and on the horizon is a new global standard on automatic exchange by 2018. 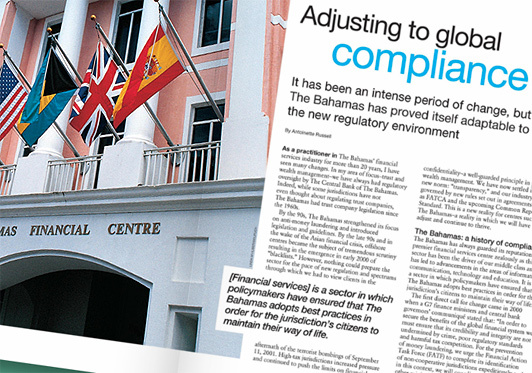 Some would have foreshadowed dark days for The Bahamas since the first regulatory changes in 2000. While there have been adjustments, those bleak forecasts have not been realized. Yes, the sector is changing and rationalizing cost and business lines, however, at the same time, The Bahamas as a sovereign, compliant, well regarded jurisdiction is positioning itself for continued growth which will come from looking towards the future. There are several key issues which must be addressed to thrive in this new era. Firstly, The Bahamas must draw on its traditional strengths of wealth management and encourage firms to locate here and thereby benefit from improvements to the business environment and the ease of doing business–both of which are key. Secondly, The Bahamas must rationalize its immigration policies. As an international financial sector, our immigration policies must be transparent and predictable when securing work permits for key personnel and in terms of residency for persons who wish to maintain a meaningful base of operations in the country. As the sector grows, so too will opportunities for Bahamians. Thirdly, The Bahamas must continue to add value and this can be accomplished by increasing our competitiveness, efficiency and cost of doing business while increasing the value we provide to ensure the sector’s growth. And finally, The Bahamas must deepen its product offerings both by emulating successes elsewhere and innovating as we compete with other jurisdictions for business. This process can be facilitated by ensuring that we have the necessary resources within our jurisdiction to provide the services being demanded by clients. We should be seeking to attract the best and brightest in financial services structuring to complement our product offering and continue to expand our cadre of highly trained industry professionals and worldwide business networks. The Bahamas is well placed to succeed in this new environment. The speed of our success and the opportunities for growth will very much depend on our speed in addressing some of the issues mentioned above.